Stan was faced with a difficult garden watering problem in which he had to get water from a spring to a greenhouse that was located several hundred feet away and 50 ft uphill from the spring. The flow requirement was relatively small at about 3 gpm for for an hour and half a day about 3 times a week. Using a conventional AC powered pump would have meant running a lot of wire, and the 800ft distance would have meant a larger than normal wire gage to keep the voltage drop from being excessive. Using one of the submersible well pumps that are made to run directly from solar PV panels is a nice solution, but the pumps are expensive and they require quite a bit of PV panel area to drive. So, this would have been an expensive solution for the relatively low flow required. 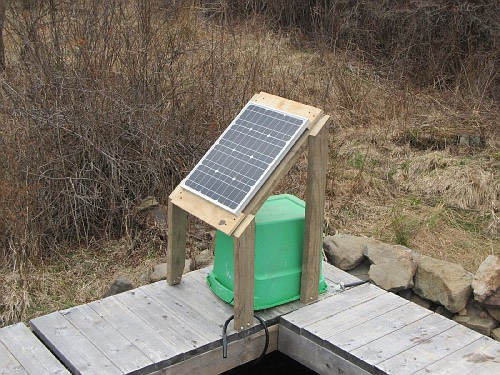 PV panel at spring -- green bucket covers pump and battery. Stan's solution was to use a relatively inexpensive 12 VDC Shurflo pump that is intended for spraying and RV applications. The pump draws about 8 amps, so, to drive it directly with PV panels would have required at least 100 watts of PV array, and perhaps a linear current booster for startup. Instead of direct PV drive, Stan incorporates a deep cycle 12 volt battery to drive the pump, and then uses a small (30 watt) PV panel to charge the battery over the course of the day. 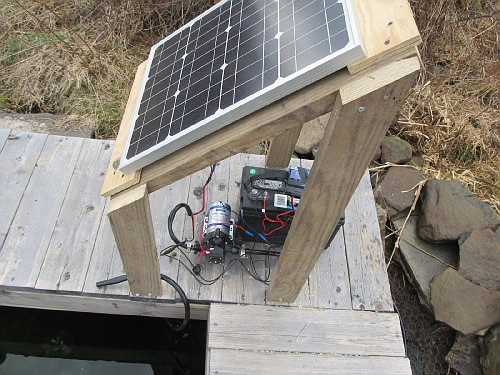 This works well because the run time for the pump is not very long and can be handled by the battery, and the PV panel has all day to recharge the battery. Pump, battery and charge controller under PV panel.